Like many studio flash heads, this light has a Bowens “S”-type accessory mount, allowing it to fit common softboxes, beauty dishes and reflectors. 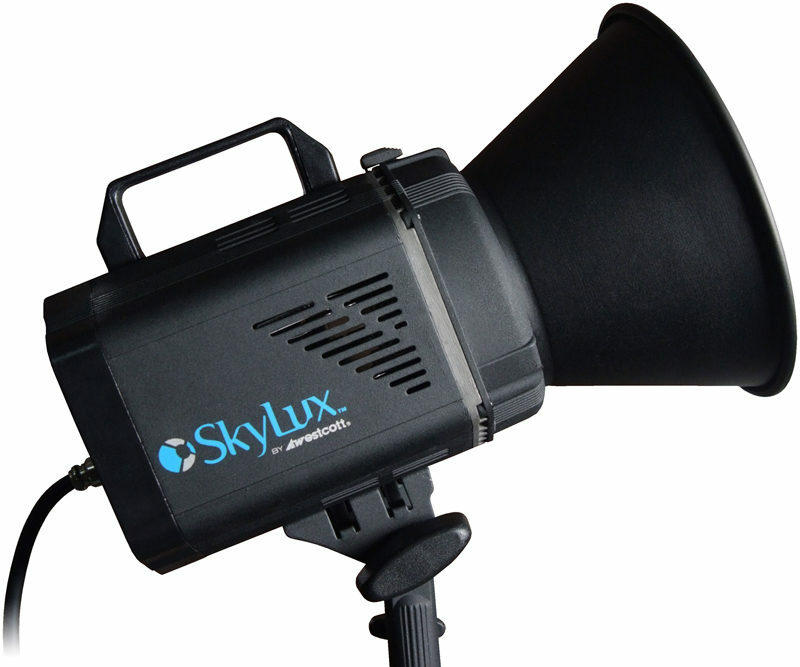 But the Skylux is not a flash unit — it’s a continuous lamp. It doesn’t run hot like a tungsten light, nor does it use nearly as much energy. So you needn’t be so worried about fireproof softboxes, sweaty models and high electricity bills every time you use it. 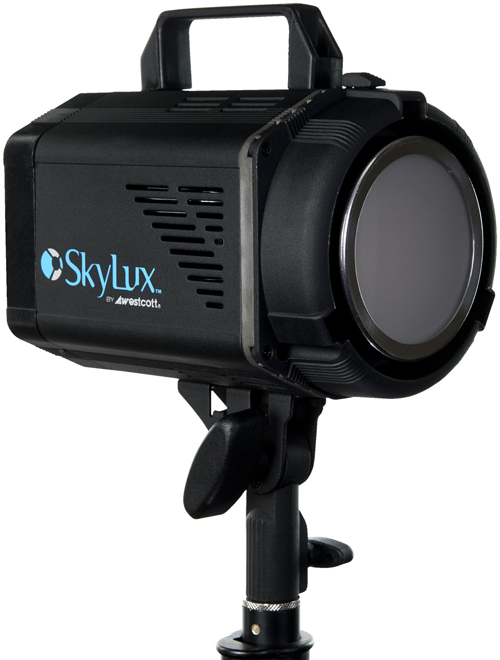 The Skylux puts out 5600K daylight-balanced light and accepts a range of accessories such as umbrellas or anything with a Bowens-fit speedring. An adjustment dial on the back lets you adjust the light intensity and the light stand bracket can tilt back and forth. This isn’t the first S-fit LED — we’ve compiled a list of seven other options for your perusal here — but it is one of the first big brand units to make its way to the UK. According to Westcott, the Skylux studio LED has a colour rendering index (CRI) of at least 94, providing a “full-colour spectrum of light”. It’s also said to be durable enough to hold even very large light modifiers, such as Westcott’s own 7-foot (2.13m) Octabank. The diodes have a lifespan of 50,000 hours and there is a “quiet” cooling fan with “flicker free” lighting suitable for film-makers. 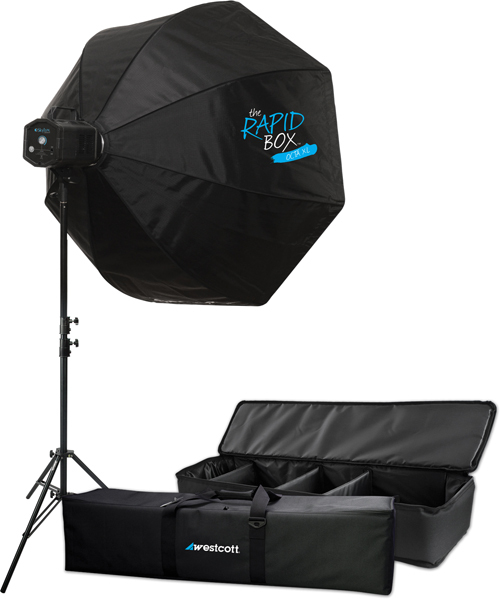 As well as being sold individually, the Westcott Skylux is to be available in kits including softboxes, reflectors, stands and studio cases, priced at £1,550 (36-inch Octa, 10-foot stand) and £1,620 (48-inch octa, 13-foot stand) including VAT. Previously available in America, the Skylux has been brought to Old Blighty by Westcott’s distributors, Johnson’s Photopia. However the direct dollar-to-pound conversion — $1,199.90 to £1,200 for a single head — might elicit cries of “rip-off Britain” from some UK-based photographers. Other options (which may or may not have comparable light quality) are considerably cheaper. What do you think? Would you buy this? For more technical information visit the FJ Westcott product page.